As we suspected, the all-new fifth-generation 2020 Subaru Outback is coming soon and will launch in late 2019. Dominick Infante, Subaru of America Director of Communications, confirmed to Car and Driver at the 2019 Chicago Auto Show that customers can expect to see the new-generation Outback later this year. Both Outback and Legacy are manufactured on the same assembly line in Lafayette, Indiana and share much of the same platform and the same engines. We can now get a good idea of what is coming on the 2020 Outback because we have the all-new 2020 Subaru Legacy as a template. When the sixth-generation 2020 Outback arrives next year, it will grow in the interior room like Legacy because of the new Subaru Global Platform (SGP) offering a modular chassis. Like the new-generation sedan, Outback will come with increased rigidity in the body and chassis translating to improvements in ride quality and handling, in addition to less noise and vibration in the cabin. This will be reason enough to wait for the 2020 Outback. But there are a lot more upgrades coming. When the new-generation Outback arrives next year, it will likely feature a new turbocharged 2.4-liter direct injection four-cylinder engine replacing the old six-cylinder Outback 3.6R. Like the Legacy, it will likely be called the Outback XT and use the same Ascent-sourced turbocharged 2.4-liter 260-hp 277 lb-ft of torque Boxer engine. It will also get a newly-redesigned 2.5-liter Boxer engine with 182 horsepower as its base engine. Both will be coupled with the new continuously variable automatic transmission (CVT). Fuel-mileage on the 2.5-liter power plant should increase to 33 mpg highway. The new Outback FA24 2.4-liter boxer turbocharged direct-injection boxer engine will achieve acceleration and power equal to or better than that of competing vehicles with 3.5-liter 6-cylinder engines. That is accomplished by adding torque over horsepower because torque is what gets a vehicle moving from a stop and helps in pulling the vehicle up a hill, or when towing. 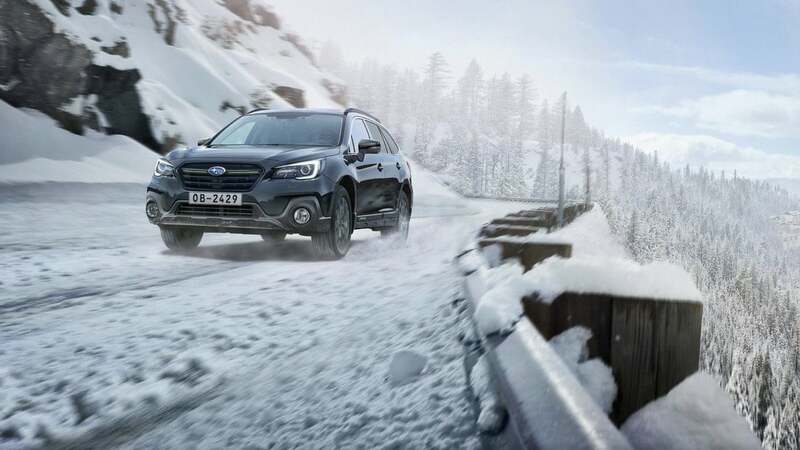 The current-generation 2019 Subaru Outback will tow up to 2,700 lbs, while the new Subaru Ascent with the 2.4-liter turbo engine has the ability to handle heavy-duty loads with a max towing capacity of 5,000 lbs. The 2019 Outback with the 3.6-liter naturally aspirated Boxer engine has 256-hp and 247 lb-ft of torque. With the new 2.4-liter turbo engine, Subaru could bump up the tow rating on the new 2020 Outback for those wanting to tow a bigger trailer. It’s no surprise, but the exterior design language will remain conservative with Outback like the new Legacy. The crossover will receive some updates, including a slightly redesigned front end and rear changes to the taillights resembling the new Legacy and Ascent stablemates. Customers will benefit from Outback likely getting a wider tailgate opening. Big changes are coming in Outback’s advanced safety tech. The fifth-generation Outback will come with standard EyeSight driver assist and look for Outback to get a new Lane Centering Function. The new function provides steering assist when the vehicle veers outside its lane, helping the driver maintain a direct path. Outback will also likely get the new DriverFocus Distraction Mitigation System that made its debut on the new 2019 Forester and now on Legacy. The biggest change on the inside will be the same tablet-style 11.6-inch full HD multimedia display advanced infotainment screen as found in the Legacy using a vertically oriented layout. Outback will also get in-car Wi-Fi connectivity for the first time providing internet access via high-speed LTE communications. The next-generation 2020 Subaru Outback will keep its core values and the SUV will keep its “go-anywhere” attitude with 8.7-inches of ground clearance, all-wheel drive will remain standard on the Outback, and it could get Forester’s new Dual-Function X-Mode for more extreme off-road adventures. When Outback arrives later this year, look for the all-new wagon to be even more popular with active consumers looking for an SUV-alternative all-wheel-drive vehicle. While none of this has been confirmed by Subaru, we have the new Legacy as a template for what is coming soon. Stay tuned. Hopefully they'll fix the crappy stereo with the issues and inability to logically process USB folders like the Crosstrek already did back in 2016. I like the small size of my impreza but I would certainly consider an Outback with the 2.4 liter turbo. I drive a 2015 Forester XT which has a 2.0l turbocharged engine. After almost 5 years of loyal service, I haven't had any problem with it, whatsoever. The secret is probably as with other turbos, to keep it serviced on time. Quality oil and OEM oil filter. When starting cold, let it idle for 1 to 2 minutes. Same is valid before turning the engine off. It is a rather fast SUV and I wish Subaru would come out with a new Forester XT. At the mean time, I might look at the Outback XT, as a partial substitute. I bought a '19 Outback. I would have waited for the '20, but found out it would have the annoying stop/start feature. I think you meant to write "sixth generation". Love my gen 5, look forward to the next one with better towering capacity. That'll sell me.